Pencil: pencil lead is actually graphite (harmless). It is not poisonous lead. Even colored leads are not toxic. Retained Foreign Object. This happens if part of the sharp object breaks off in the skin. The pain will not go away until it is removed. Wound Infection. This happens in 4% of foot punctures. The main symptom is spreading redness 2 or 3 days after the injury. Bone Infection. 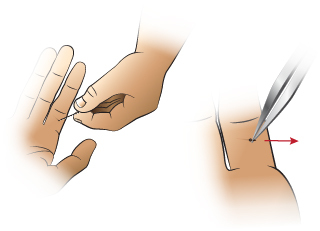 If the sharp object also hits a bone, the bone can become infected. Punctures of the ball of the foot are at greatest risk. The main symptoms are increased swelling and pain 2 weeks after the injury. Most puncture wounds do not need to be seen. First wash off the foot, hand or other punctured skin with soap and water. Then soak the puncture wound in warm soapy water for 15 minutes. For any dirt or debris, gently scrub the wound surface back and forth. Use a wash cloth to remove any dirt. If the wound re-bleeds a little, that may help remove germs. Then, cover with a bandage (such as Band-Aid). 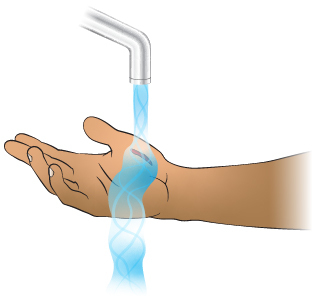 This helps to reduce the risk of infection. Re-wash the wound and put on antibiotic ointment every 12 hours. Do this for 2 days. Puncture wounds seal over in 1 to 2 hours. Pain should go away within 2 days. 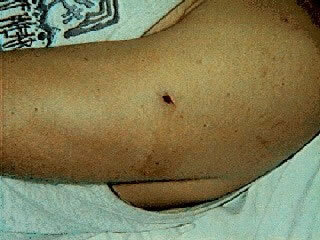 This photo shows a puncture wound from a BB gun in left upper arm. Note the small hole in the arm where the BB struck and entered the skin.